The DBK Drymatic System gives you, the water damage technician, a tool or combination of tools that can be used to significantly enhance the performance your water damage restoration programs. You are taught the importance of Humidity, Airflow and Temperature in any water loss program, however, Temperature is often overlooked and underestimated as a critical component in a fast, efficient and cost effective drying regime. We are all familiar with creating the conditions to increase evaporation; reducing the humidity of the air and managing airflow and temperature. However, the bottleneck in drying is the removal of the bound water within the structure that dictates the duration of the drying process. Studies have shown that you can dehumidify the air in the drying chamber as much as you want but this does little to influence the diffusion rate of the water molecules held within the affected material. Diffusion rates can be influenced by manipulating the temperature of the wet material, making the water molecules within the structure more energetic and increasing the rate at which they move to the surface, where evaporation into the dryer (lower vapour pressure) air occurs. Water can exist in three different phases; a solid, liquid and a vapour. When water leaves a structure due to evaporation (the phase change from a liquid to a vapour) it takes energy (heat) from the evaporating surface and this is referred to as evaporative cooling. Evaporative cooling is the reason why you can easily spot ‘wet’ areas on a thermal imaging camera; the ‘cold’ spots detected are potentially where water has evaporated from the structure and cooled the material it has left behind. The challenge for you, as a restorer, is to ensure that you are replacing the energy that is taken away during the evaporative process – failure to do so will result in a drop-off in the evaporative rate as the structure progressively gets cooler and the water molecules become less energetic. Traditionally the approach would be to install refrigerant dehumidifiers inside a property to reduce relative humidity by removing moisture from the air in the drying chamber. In order to support this process a technician would install multiple air movers throughout the drying chamber and these would help lift the water from the materials in to the air to be processed. Once all of the readily available water was collected and processed by the dehumidifiers the equipment was essentially sat waiting for further diffusion/evaporation to take place; in porous materials this was not such a hindrance but dense material such as concrete have a low porosity and could take weeks or months to dry fully in ambient conditions. The DBK Drymatic System offers water loss technicians a unique and innovative approach that will result in significantly reduced claim life cycles and associated costs for the insurer, insured and the restoration company. The Drymatic drying methodology is based on a combination of controlled heat and carefully managed airflow within the drying environment. Drymatic Boost Box when combined with the Drymatic Wall and Floor Systems gives technicians the ability to directly target heat energy, in a controlled manner, into the water damaged materials whilst maintaining constant airflow across the surface of the affected area. Introducing heat energy into the process increases the temperature of the materials and subsequently speeds up the evaporation process; additionally, the constant replenishment of heat energy overcomes the constraints introduced due to evaporative cooling. Airflow is still required to ensure that the super saturated layer of air at the surface of the material (boundary layer) is removed efficiently, allowing more moisture to transport to the surface. You are now evaporating quickly, efficiently and in a controlled way. You have successfully introduced a drying process that promotes fast and efficient evaporation of moisture from a wet material in to the air in the room. Now what do you do with the moisture that is held in the room? Drymatic II is a system that uses a combination of heat and air exchange to efficiently manage the conditions within your drying chamber; within room limits defined by the user. Historically, a technician would deploy a dehumidifier and aim to control the room temperature within a narrow band to maintain performance of the dehumidification system (25-35C or 77F-95F); in many cases this is the optimal solution but there are limitations. Drymatic II does not rely on the use of refrigerant nor desiccant technology so it is not limited by the performance constraints associated with those particular systems. The Drymatic II system removes moisture from the drying chamber through an air exchange process; expelling wet air from the building and bringing in a source of relatively dry air from an unaffected source – this air is then heated before being distributed around the drying chamber. Due to the fact that Drymatic II uses an air exchange process it can operate in an extremely wide temperature window (0C-50C / 32F-122F) and the limitation is the capacity of the air to hold moisture (GPK/GPP) and the rate at which you can load that air with moisture from the structure. 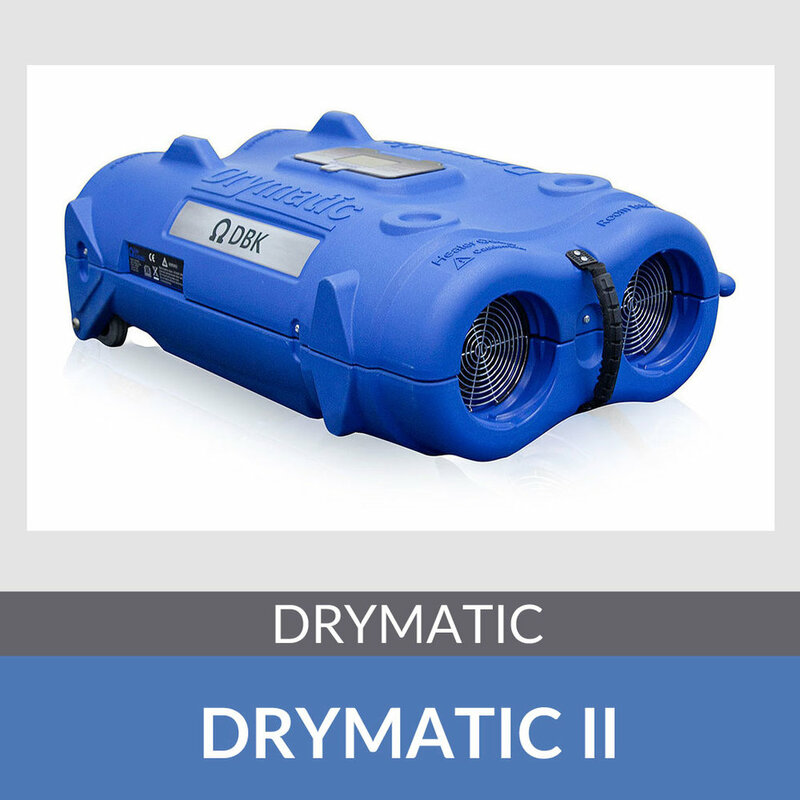 Using Drymatic II, you can set room limits within your drying chamber (Maximum Temperature, Maximum %RH and Minimum %RH); these limits allow you to expand or minimise the range in which you can dry a water damaged property. For example, in some historic or heritage properties the materials or constructions are protected by local authority or national guidelines and must be dried in a controlled way. These limitation include restrictions on temperatures and relative humidity conditions and Drymatic II gives you the control required to maintain an optimal drying environment. Drymatic’s unique drying algorithm continually evaluates and adapts to changes in the drying chamber and the unit automatically determines which mode of operation to run in (Recirculation or Exhaust) and also adjusts its own heater power to save energy on a claim or to compensate for significant losses in ambient temperatures.